Schools in England will be sent copies of the King James Bible from this week to mark its 400th anniversary. Education Secretary Michael Gove said the text had had "an immense influence" on the English-speaking world. He said pupils should learn about its role in the nation's history, language, literacy and culture. The move is being funded by charities. But secular groups said the money could have been better spent elsewhere. 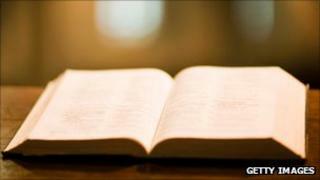 Critics say it is unlikely that schools do not already have a Bible. Concerns had also previously been raised that the cost of providing the Bible to schools would be met by the taxpayer. But the Department for Education said the cost of the £370,000 project would be met by charities and philanthropists. The first copies will be delivered to schools this week, with all schools expected to have their edition by the end of the month. Mr Gove said: "The King James Bible has had a profound impact on our culture. "Every school pupil should have the opportunity to learn about this book and the impact it has had on our history, language, literature and democracy. "Thanks to the generosity of a number of charities, supported by philanthropists, we have been able to mark the 400th anniversary of its publication by making a copy available to every school in the country." But Terry Sanderson, president of the National Secular Society, said: "This is not simply another piece of literature, it is the holy scripture of one particular religion. "The money used for this project could have been better used to sponsor other books that are less easily available to pupils." He added: "It will be very interesting to hear which charities have sponsored this. "We have a feeling that they will be much more interested in the proselytising opportunity that this offers than the benefits children will gain from its literary merits."